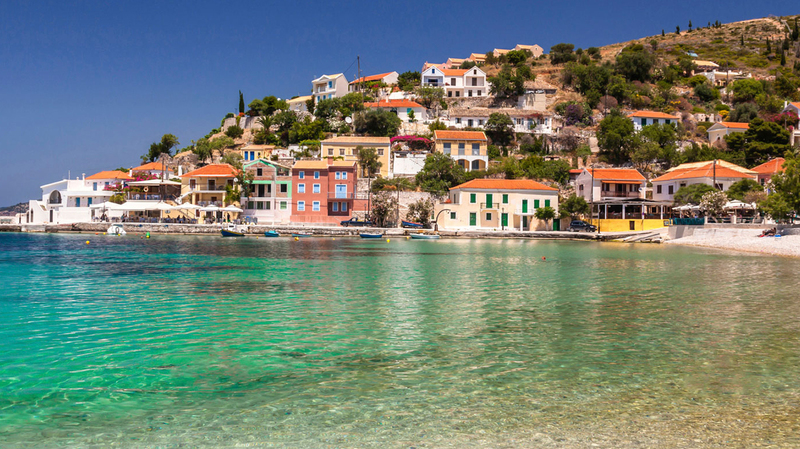 Search for the best flight prices from Stansted to Kefalonia. Compare prices, book today and save money with Stansted Airport. One of Greece’s most treasured islands, this sun-drenched escape is ideal for holiday-makers who want to enjoy the natural luxury that is Greek island life. Perfect for either a relaxing beach holiday, or to explore the rich history and charm of this ancient culture, here you can immerse yourself in the best of everything that Greece has to offer. Particular attractions include a local passion and expertise for the making of fine wine, a thriving collection of tourist and traditional towns and not to forget the amazing offering of delicious cuisine available from the island’s many tavernas. It is recommended to base yourself at one of the well-known beach resorts such as Ássos, Fiskárdo or Skála, rather than at capital Argostóli or ferry ports Póros or Sámi. The accommodation is mostly self-catering studios and apartment in castle-stooked Ássos and northern Fiskárdo, which escaped damage during the 1953 earthquake, while Skála boasts the welcoming beachside Anassa Hotel. Exceptions to this pattern include the highly-rated Trapezaki Bay Hotel (Trapezáki Beach, below Lourdáta) and 22-room Odyssey Hotel in Agía Efimía. If you do plump for Argostoli, indulge in a spot of luxury at the Ionian Plaza (Platía Vallianoú). Local products are all the rage in Kefalonia, similarly to so many Greek islands. Crisp white robóla wine is a real specialty, particularly the Gentilini label, whose winery can be visited at Miniés. Mavrodaphne is recommended for those keen for an intense, dry red, although this should not be mixed up with the Peloponnese’s Mavrodaphne dessert wine. There is usually a soupçon of fir to the island’s honey, thanks to the dense fir forests of Mt Énos, while the pedestrianised Lithóstrato is Argostóli’s main shopping area. Meanwhile, the highest concentration of tourist boutiques can be found in Fiskárdo. There is a fairly even scattering of decent tavernas around Kefalonia, although areas such as yacht-heavy Fiskárdo can be a little pricey. There is usually solid reward for exploring off the beaten track, for example on the beach below tiny Spartiá village, where the fresh fish at Waterway is delightful, while the casserole dishes at Xouras (Petáni Beach) come highly recommended. Just outside Agía Efimía you'll find the popular Paradise Beach Taverna, while Platanos in Ássos offers spit-roasted suckling pig and Panos’ own-grown ingredients. Elsewhere Lixoúri’s Akrogiali (south end of quay) features superb grilled dishes, while Argostóli’s Kyani Akti (Andóni Trítsi 1) is well worth the expense thanks to its attractive setting cantilevered over water. Each year, on or around 15 August, a number of harmless small snakes appear in and around Markópoulo village church, as legend has it representing the nuns of a vanished local convent, who were transformed in order to escape capture by pirates. The relics of Kefalonia’s patron saint, Gerasimos, are at a monastery near Frangáta, and on 15-16 August and 19-20 October especially, pilgrimages are made in order to kiss his cloth-covered feet. Robóla wine is a real feature of this three-day wine-tasting event in the village of Frangáta, that takes place after the Gerásimos feast. This music festival in the island’s capital sees international and Greek artists perform at a variety of venues, some of which are open-air. Lixoúri is Kefalonia’s second town, and this festival heavily features the local brass band, or filarmonikí.